Musings of a Citi Sketcha: From Stamford to Victoria: the story of our library remains a colony. From Stamford to Victoria: the story of our library remains a colony. After a year-long series of events to commemorate the closing of one chapter and to beginning of a new one, the iconic red-bricked National Library at Stamford Road closed its doors for the last time on 31 March 2004. 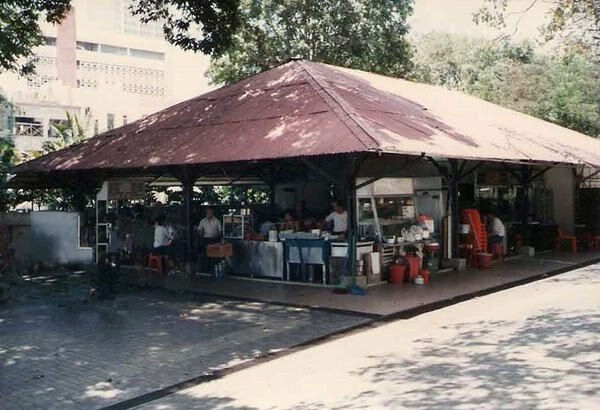 We said goodbye to the place as well as the fondly remembered wan ton (meat dumplings) noodles and ice kacang stalls at the adjacent kopitiam. The National Library at Stamford Road held and still holds a special place in the hearts and minds of many Singaporeans who have had the privilege of walking its now invisible but hallowed grounds. Half a century later, Lee Kong Chian’s legacy and support continued with a $60 million donation for the Lee Foundation towards the development of the new National Library at Victoria Street. The reference library is named in honour of Lee Kong Chian. The new library at Victoria Street. The National Library moved to its new home on 22 July 2005. Located on an 11,304-square metre site between Bugis Junction and the Bras Basah Complex at 100, Victoria Street, the current building, a 16-storey, two-block development situated in the city's Civic District, replaces the old National Library at Stamford Road. As the flagship building of the National Library Board, designed by T.R. Hamzah & Ken Yeang, it brings together the core functions of the old library: as a reference library, known as the Lee Kong Chian Reference Library, as well as a public library, the Central Public Library, under one roof. The architecture consists of two 16-storey blocks, linked by skybridges on every floor. The building also houses the Drama Centre from Levels 2 to 5, which is managed by the National Arts Council. On the 16th floor, there is a closed viewing point called The Pod. It is only used for functions and events, and is not a viewing gallery. From the Pod, it has a panoramic view of the island of Singapore, outlying islands, and also neighbouring countries such as Malaysia and Indonesia. There are also many gardens in the building but only two are opened to the public. They offer a good view of the city, and one is the Courtyard on Level 5 and the Retreat on Level 10. The building has three public panoramic elevators with a city view. The National Library Board headquarters is on the 14th floor of the building. The building has escalators from Basement 3 to the 14th storey. It has a carpark with 246 lots. On the first floor are the main entrance and a café, with a big space the Plaza and is sometimes used for exhibition space. A number of old bricks from the old library at Stamford Road are in this new building.